Truffles NC Black Truffle Products and Information: Do I Really Need a New Tractor??? Do I Really Need a New Tractor??? OK. I admit it. There are a lot of things I need worse than a new tractor -- but, hey, it's tempting. I mean, the old tractor is big and -- yeah, it's old. A new tractor that's smaller and serves the purpose of my mowing and moving stuff around and tilling in that lime in the spring. I would love it. AND, it drinks diesel -- not gas like my mower. I like that aspect. So, here's the thing. It's expensive!!! The biggest benefit would be that I wouldn't be afraid to get on it and do what needs to be done all by myself. I could change the implements without any help. I wouldn't have to rely on the scheduling of others to get my work done. Is this beginning to sound like I need to be in control of my own truffle domain? Bingo! That's what it's all about. Here's the reason I'm thinking about it at all. 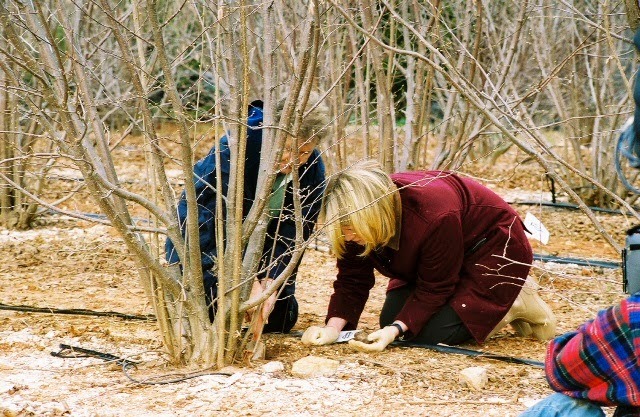 Back in 2004 and 2007, we planted 500 (mostly filbert inoculated seedlings) in what we will now call Test Orchard #2. The past 2 years, because we knew we had EFB bigtime in that orchard, we started spraying Growers Mineral Solution on the foliage in the hope that stronger trees would hold out against the blight. I couldn't come to terms with the idea of spraying fungicide which is the recommended treatment. Looks like EFB loves Growers Mineral Solution and the experiment was a dismal failure of enormous proportions (think $10,000 worth of trees gone to their great reward). So :-\ , now what? Pull out those trees and forget the whole thing. It was a just a bad dream. Do some soil testing and see what the mycelium concentration is in the soil. If it's high, plant some regular uninoculated oak seedlings in the place where the trees are dying and irrigation is in place-- and see if those trees will adopt the truffle mycelium. Maybe we could still get truffles in that field because of the already concentrated mycelium in the soil. My farmer gene must be in high gear this morning. Farmers have to be comfortable with saying "maybe" a lot. I'll never forget unearthing truffles here with Martha Stewart. Can't let it go. I'm pondering the possibilities in the replanted Orchard #1. My thinking is that we could get truffles in 5 years easily in this 4 year old orchard which was a replant from Test orchard #1. Maybe because that particular orchard placement is so perfect OR because it was a replant from a producing orchard where the soil itself is fully inoculated. That original tree species just simply couldn't hold out against the blight. Now it's planted with blight resistant filberts and oaks. SO -- that's what I would do with a new tractor -- rework the orchard that's about to bite the dust. About 50 of the 500 trees in that orchard were inoculated with truffles that grew in Test Orchard #1 where Martha visited and got truffles.. Some grant money for that soil testing would be a real good thing. It won't be cheap. Any scientists out there reading this? Comments would be most appreciated. Now, do I really need a new tractor? Anybody want to buy a tractor? If buying a tractor will move you closer and faster to your goals - maybe it's the right thing to do. However, if the $$ would be better spent on other activities/tasks/items that can move you closer to success faster, hold off on the tractor. Jane, you're an awesome and persistent truffle farmer! How about crowdfunding your tractor through Indiegogo.com or another resource? Then, you might have your truffles and eat them too! Great idea. Thanks for your praise and encouragement! Jane my name is Michael. I have one message for you. Don't give up. I have a small truffle orchard in TN. About 300 trees and I am hoping for some production Fall of 2015. I have read where in Europe they have reinoculated orchards where production has fallen off. Maybe you can spray the fungicide to kill the EFB then reinoculate the trees once the fungicide has done its job. It may be worth looking into. Thanks Michael. These trees are too far gone to save but I will not give up.I'm seriously considering a kickstarter project to raise the money for a new tractor,a shelter for truffle educational seminars and replacement seedlings and inoculum.stay tuned! I don't know how to quit.